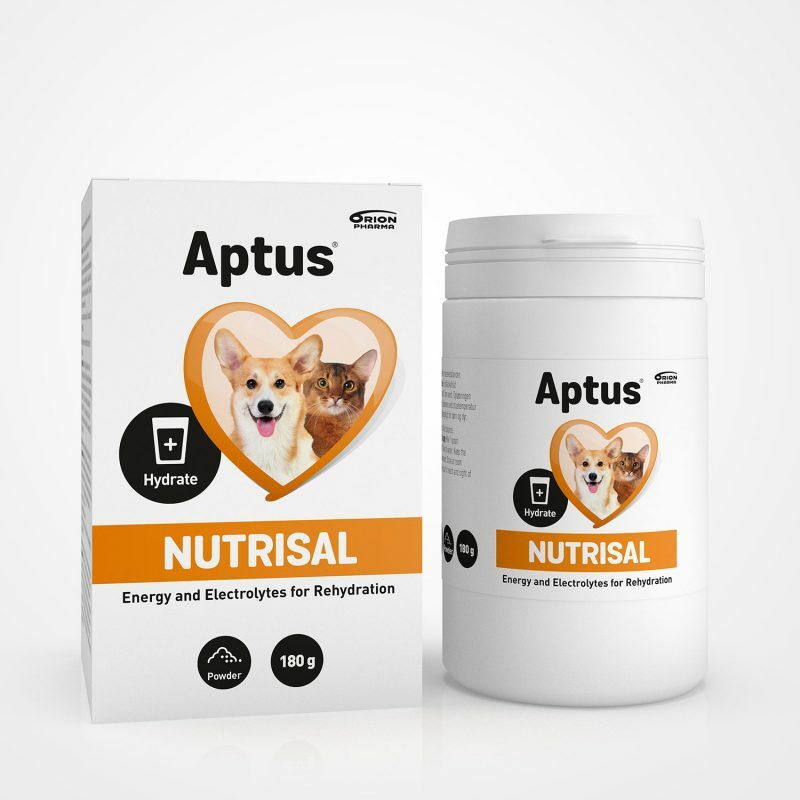 Water soluble powder for fluid replacement developed for dogs and cats. A combination of essential salts called electrolytes and glucose. Recommended in during occurences of gastrointestinal disorders, such as diarrhoea, to maintain the fluid balance in the body. Mix 1 spoon (20 g, included) of Nutrisal powder with 1 liter of water. 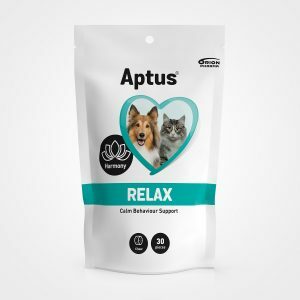 Keep the solution available for your pet to drink. If your pet is too exhausted to drink, use a syringe to give the solution directly by mouth in small doses. Make sure the animal swallows between the doses and do not lift its head too high. Use the ready-made solution within 1 day. Nutrisal can also be mixed with food. Use to replace fluid and electrolyte loss, e.g. during occurences of gastrointestinal disorders, such as diarrhoea, or after hard work / exercise or during hot weather. In case of diarrhoea, ensure your pet’s adequate fluid intake, at least ½ -1 decilitre per kg /day. 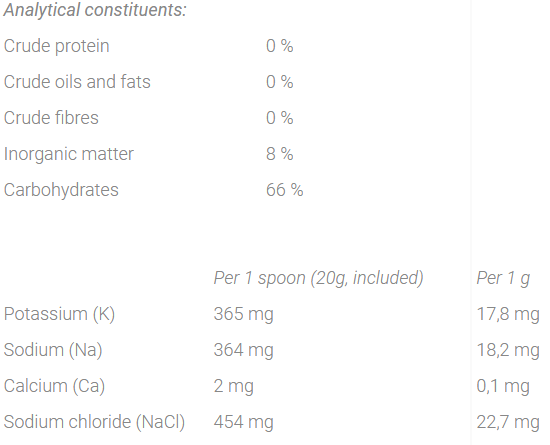 Mix 1 spoon (20 g, included) of Nutrisal powder with 1 litre of water. Give at least ½ -1 decilitre of fluid per kg /day. Cats may drink less than dogs. Dextrose, Maltodextrine, Potassium chloride (3,4 %), Sodium bicarbonate (3,4 %), Sodium chloride (2,3 %). Nutrisal consists of essential salts called electrolytes, and glucose. The ready-made solution replaces lost water and the essential salts required by the body for fluid balance. Glucose gives energy. Nutrisal prevents dehydration which occurs when the body is losing more fluid it can take in. This might occur in gastrointestinal disturbances, but also during hard work especially on warm days. Nutrisal provides the essential electrolytes in the proper balance for maximum hydration. 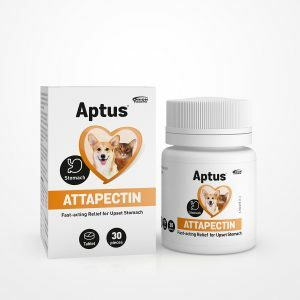 In case of upset tummy and loose stools, Aptus Attapectin provides fast-acting relief. 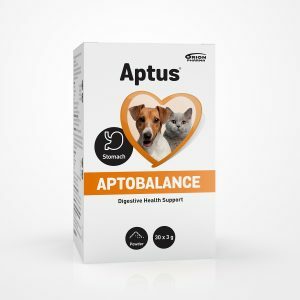 Aptus Aptobalance contains probiotics which help balance digestive health.